We’ve been blockading all entrances to the Council House since this morning, trying to physically prevent Councillors from entering for the budget meeting, where the cuts will be undemocratically voted through. Not surprisingly, most Councillors were not willing to engage with us in debate. 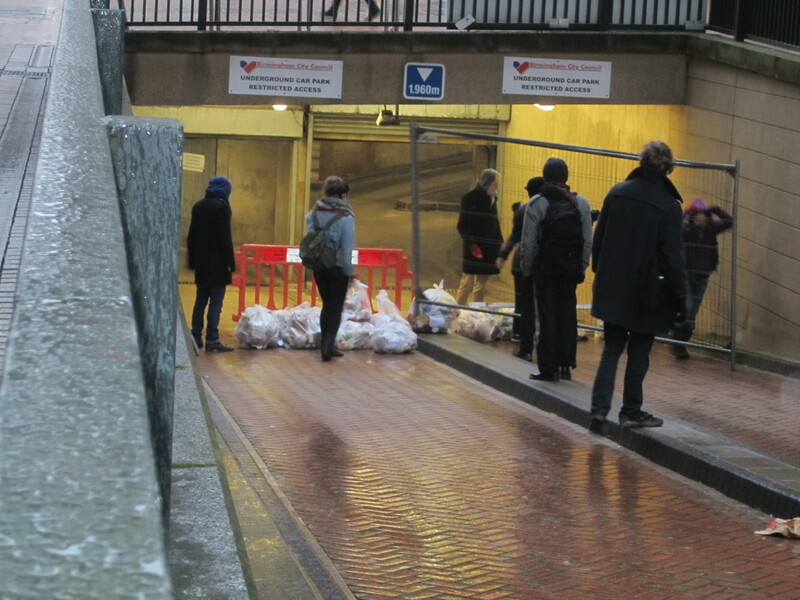 The police have helped push the cuts through by forcibly attempting to break up the blockade and get Councillors inside. One activist managed to find a way inside the Council House during the meeting, and heckled Albert Bore before being carried out by security. One activist managed to find a way inside the Council House during the meeting, and heckled Albert Bore before being carried out by security. 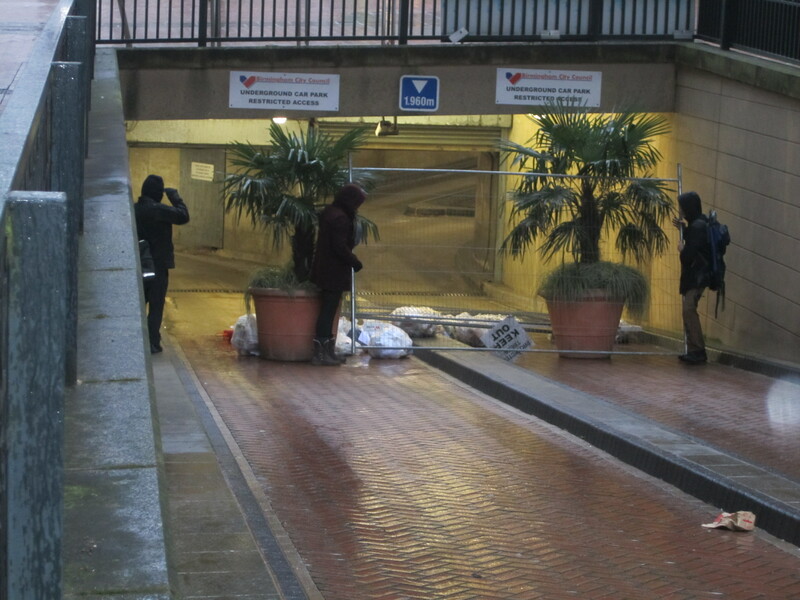 Early this morning before the Council House opened and hours before the publicly announced blockade at 11am, protesters barricaded the Council House main entrances. We are taking this action because austerity is economically backward and is not helping the economy. Furthermore, these cuts to Birmingham are highly undemocratic and against the will of most people living in the city – who didn’t vote for this. 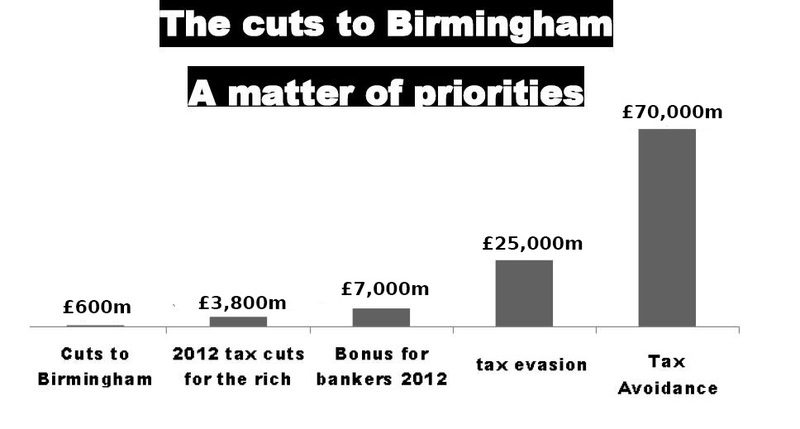 The cuts to Birmingham are wrong and that they will devastate thousands of people’s lives. We feel compelled to take action to protect the most vulnerable. The £101m of cuts to be voted on today in Birmingham include a cut of £32.7 million to the Adults and Communities budget, £23.8 million to Children Young People and Families, and £28.3 million to Leisure Services. High on the hit list are: Voluntary Sector Funding (£4.4m), Children Centres (£3m), Children Residential Care Homes (£1.6m), Children and Adolescent Mental Health Service (£1.4m), Home to School Transport (£1m), Youth Service (£0.47m) and reduced subsidy for the Meals Service (£0.4m). We must now fight these cuts on the ground service by service. Victories can be won! Campaigners across Birmingham have overturned cuts with well-organised campaigns. Parents campaigned and stopped the West-Heath school from becoming an academy; the parents of the children of Charles House respite centre for disabled children beat back cuts by storming constituency meetings and shaming their officials into backing down. The Cotteridge community united to keep the Merrishaw Nursery open and stopped the planned closure. Make sure you stay in touch and get involved anti cuts campaigns in Birmingham. The richest are taking huge tax cuts while we are hit by the bedroom tax. They are ever richer, living in ever bigger mansions while across the Birmingham we suffer a housing crisis. 180,000 people now on waiting lists for social housing across the west midlands. Our schools are being turned into academies, waste collection is drying up, youth services are being closed and social services for families, adults and pensioners are becoming utterly unaffordable, or being cut altogether. Yet victories can be won. Campaigners across Birmingham have overturned cuts with well-organised campaigns. Parents campaigned and stopped the West-Heath school from becoming an academy, the parents of the children of Charles House respite centre for disabled children beat back cuts by storming constituency meetings and shaming their officials into backing down. The Cotteridge community united to keep the Merrishaw Nursery open and stopped the planned closure. We are writing so that all people who feel wronged by the cuts and the forces of austerity can find friends and allies. Our actions tomorrow are not at full force. Many across the city are not yet organising. Today is just one battle in a long fight against cuts and austerity. Every year the national and local governments will attempt a new wave of destructive cuts and measures, until 2017. It is up to the people of Birmingham to present a challenge to the self-interested, ideological, wealthy elite attempting these devastating changes. We can win – but only with your help, and the help of communities coming together in force. 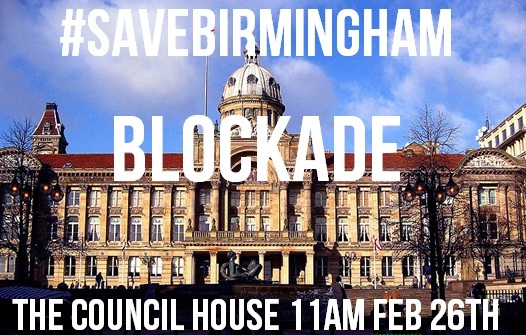 Tomorrow dozens will be taking action to blockade the Council and stop vote on the cuts budget. Next year, we it must be thousands. We must make it impossible for them to implement their cuts. We are calling for the entire city to mobilise, in preparation for the next round of austerity in a years time. The community must be on the streets. Workers must go out on strike. We must send a strong message that our city won’t work if they continue pursue their plans – creating poverty and misery for us, and unihibited wealth for them. 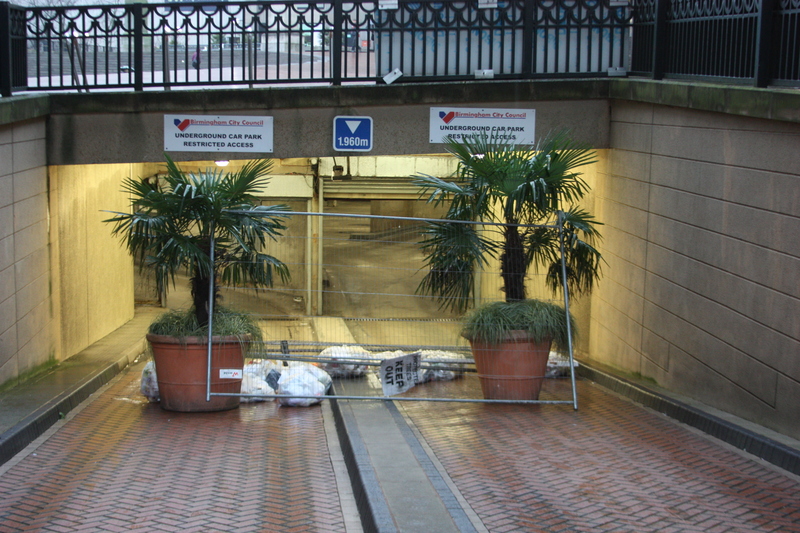 Meet 11am Victoria Square – form groups block entrances. We are calling for protests to stop the undemocratic imposition of massive cuts to social services across Birmingham. These cuts represent an assault on people’s jobs, livelihoods and freedoms to live their lives happily, uninhibited by poverty. The cuts will be voted through at a special council meeting Tuesday 26th of February – Many of us were involved in organising a simply lobby of councillors and public meeting the night before however for political reasons the council decided they didn’t want to listen & shut down our meeting http://www.facebook.com/notes/kelly-rogers/under-pressure-birmingham-city-council-admit-to-political-censorship/10151525690254813 – Leading to strong condemnation from local groups including the TUC. In response to this we should not capitulate but take even stronger action. Be it 50, 100 or 200 people who turn up this, it will be a protest against the widespread impoverishment and denial of democratic rights occurring across the UK, part of a global systemic crisis. There are plenty of political & economic alternatives for the city council and central government other than austerity. The government could be taxing the ever richer elite to fund vital services; the Labour council shouldn’t be so weakly accepting all tory cuts. We are taking this action because the current system cannot go on. It is undemocratic and unfair. 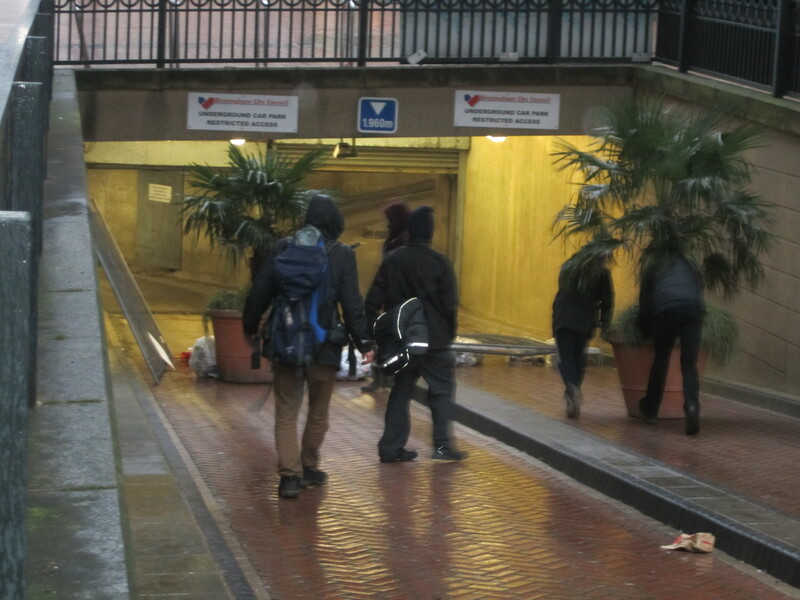 We need alternatives and are calling on the city to join with us and to seek another path. We all know that austerity is not only cruel and wrong, but that it is also not working. So to anyone who thinks we should take a stand we say to you that you will find a great many friends and supporters amongst workers, trade unionists and service users in the community. Tonight at 6:30pm the Birmingham Labour group are meeting. They have an absolute majority on the council and they are being asked by their leader Albert Bore and his Cabinet to pass massive cuts to the city’s public services that have been described as “the end of local government”. If the Labour group agrees to pass on the cuts next Monday, then Birmingham’s future will have been sold by them for the benefit of the rich. Austerity is hurting. We need a budget that meets the needs of the people of city, not greed of the banks. The central government must stop with their austerity program and cease its unfair disproportionate cuts to Birmingham and other cities. Our local government must do more to stand up for Birmingham; they should make a stand against the cuts, not merely implement them without a fight. On the 5th of January 2013 115 people agreed and co-wrote this letter calling on the council to join them in a joint campaign to save Birmingham. On the 16th of January 175 people met and collectively agreed on the need to up the ante or face complete defeat – the loss of nearly all our public services, the things that allow most of us to live decent lives. On the 3rd of February 210 people wrote this follow up letter to the council. 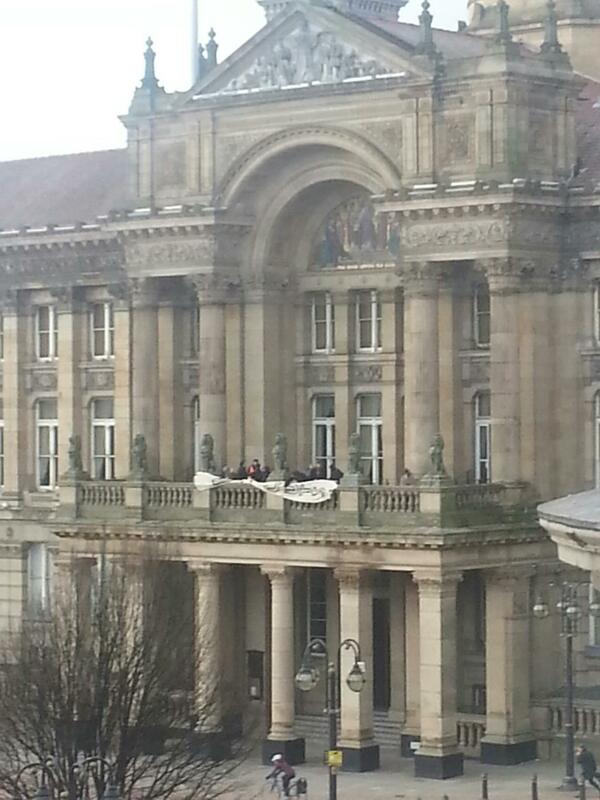 Today while we’re occupying it, and anti-cuts groups are marching on the Council house to protest these cuts. These are encouraging signs but still not enough to turn the tide on austerity. Organisations like Communities Against the Cuts (CATC) a grassroots alliance of community campaigners is a force that with your participation could become truly effective vehicles for a movement. Join CATC on Facebook here and get on the e-mail list here. Next our movement must build for the 26th of February – the day the council will formally vote through these cuts at a special budget setting meeting. Our actions on this day must be the biggest we can possibly organise. Birmingham is the UKs second city, over 100,000 people are employed in industry that puts billions into the national economy, 7.2% of national exports come from this region. If workers, services users, trade unionists and communities unite and together say that we make this city work and we won’t work unless we have a decent quality of life, fair opportunities and our public services are left intact, neither the government or the council will be able to force their cuts on us. 1) We must build the network, build awareness and confidence. Invite your friends to the Facebook event of the protest on February 26th and spread the word. Get in touch with those already organising in CATC. 3) We fight – these £625m cuts have to be voted through piecemeal cut by cut year by year up until 2017. We must build a popular movement so that the cuts will become increasingly difficult to implement.